Once on line ticjet sakes stop. There will be plenty of tickets sold at the door! They are the sane price! 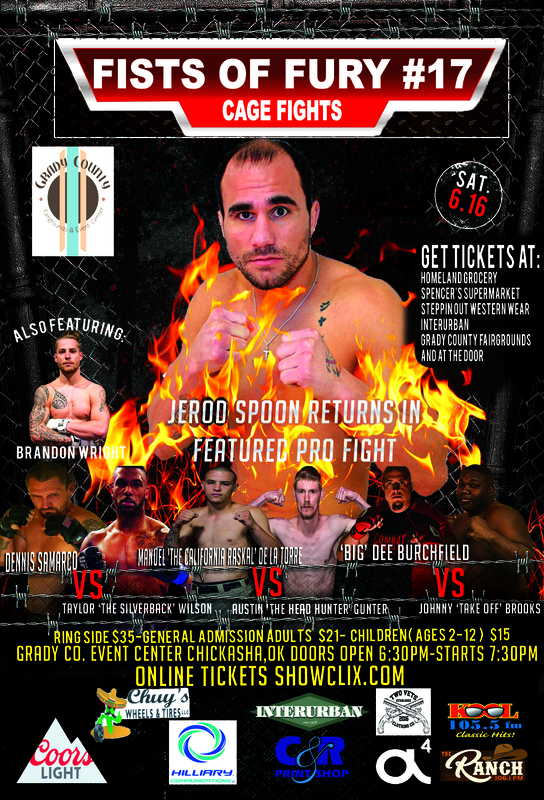 FISTS OF FURY # 17 MMA CAGE FIGHTS, IS THE FASTEST GROWING MMA FIGHTING EVENT IN THE REGION. THIS SHOW WILL MATCH UP SOME OF THE REGIONS BEST PROS AND AMATEURS IN AN ESTIMATED 11 ACTION PACKED FIGHTS INSIDE THE STEEL CAGE. THERE WILL ALSO BE 5-7 AMATEUR FIGHTS AS WELL.